Here's just a quick summary of what you need to do to get the Automated Media Center script working with Vuze and the Command Runner Plugin. 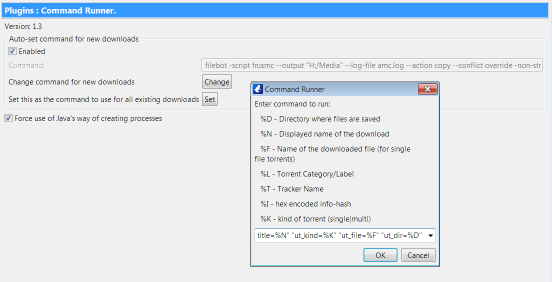 The command is the same and since µTorrent and Vuze Command Runner Plugin use the same variables %D/%F you can paste it directly into Vuze just as you would with µTorrent. If you have any issues you can check Tools->Plugins->Log Views->Command Runner to see exactly what commands have been executed. Please note that Completion Moving will interfere with Command Runner! because FileBot will be called on paths that have been moved already. So make sure to disable Completion Moving.